The Sagrada Família. I haven’t written about architecture, but I have to say something about this. While we were in Barcelona last month, we spent most of a day visiting it, and thoroughly explored the museum and workshops that are in the basement. If you go, be sure to allow yourself the time to go down and see them. As they are still in construction, they have working model shops, one with a huge scale model, and another for designing the parts of the building yet to make. There is a thorough history of the basilica, and many examples of Gaudi’s drawings and models. A lot of the plaster models were lost during the civil war, when people broke in and smashed everything up, but they were able to reconstruct quite a bit by going back and studying Gaudi’s original plans. The museum is a fascinating dissection of one of the most unique buildings ever made. One interesting thing is the model pictured above. 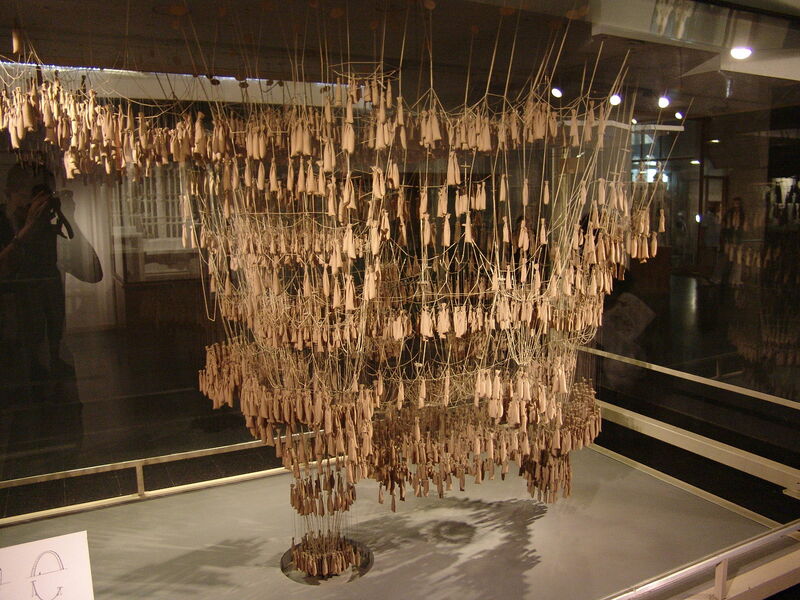 It’s Gaudi’s physical model for the arch design of the basilica. By hanging string upside down, with weights attached at points, you can map physically the form of the arches. The whole thing is in a rolling glass and steel case. The first thing we though when we looked at it is that it’s impossible that David Altmejd hasn’t seen this. It’s such an interesting object that the whole thing could be art just as it is. We were there on a gorgeous, hot, sunny day. 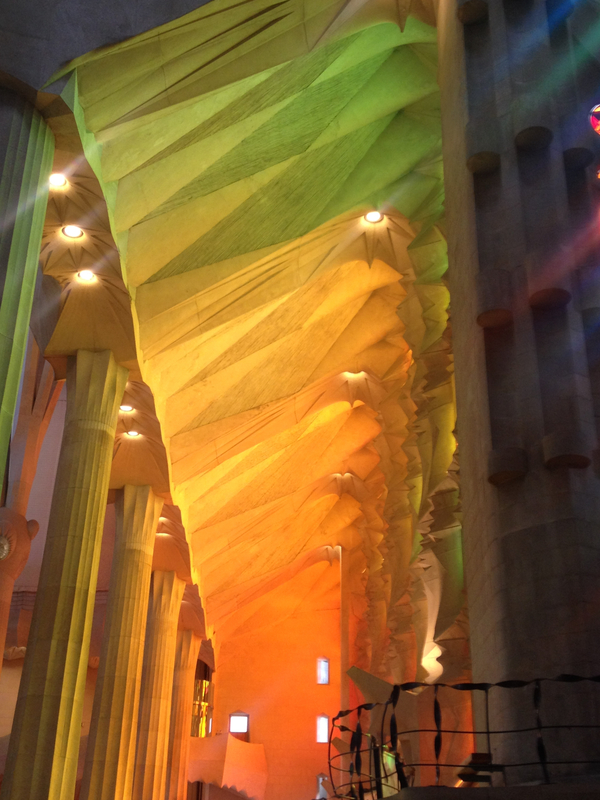 The sun was filtering through the large windows and filling the nave with a rainbow of light. James Turrell would have been impressed. It really seemed like a forest inside, the way Gaudi intended. Despite the large number of paying visitors, the space had a real calm to it. It’s a special experience, no matter your religious views might be. This was my second time visiting (the first in 2003, I think) and it was interesting to see what progress they’d made. It was hard to tell, except the stained glass windows are now installed, and I remember large stone block filling the interior last time, like it was one big construction site. Those are gone. On whole, it’s a fascinating experiment – the last gothic church built, and I think the only large religious building built on the backs of tourists, rather than believers. Lastly, the Nativity façade (the Gaudi one) is absolutely mental. This entry was posted in Installation, Went to see art and tagged Architecture, Barcelona, David Altmejd, Gaudi, James Turrell, Sagrada Família. Bookmark the permalink.